In 1976, Carter ran for the presidency, hoping to capitalize on his status as a Washington outsider in the wake of the Watergate scandal and the public's negative opinion of the Republican party. He traveled over 50,000 miles, visited 37 states, and delivered over 200 speeches before any other candidates even announced that they were in the race. Carter proved to be the only Democrat with a truly national strategy, and he eventually clinched the nomination. He became the front-runner and eventually gained the Democratic nomination. He won the election by a slim margin over incumbent Gerald Ford, with the results split largely West to East, with Ford taking virtually all of the western states, and Carter taking most of those east of the Mississippi. He won the popular vote by 50.1 percent to 48.0 percent for Ford and received 297 electoral votes to Ford's 240. Carter's presidency was characterized by rising energy costs, trouble in the Middle East, and the Iran Hostage Crisis, which played a significant role in Carter's re-election bid in 1980. 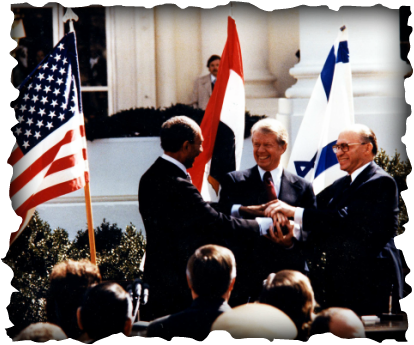 While Carter was able to broker peace between Israel and Egypt, the economy was largely flat during his presidency, and the public very quickly lost confidence in his leadership. Jimmy Carter is the only president in U.S. history to serve a full term as president, but never get to nominate a judge for the U.S. Supreme Court. He signing the SALT II nuclear arms reduction treaty with Soviet leader Leonid Brezhnev, the final year of his administration was marred by the Iran hostage crisis, which contributed to his losing his 1980 re-election campaign to Ronald Reagan.